Capstans and Winches are essential in many industries involving the transfer of bulk materials and medium to heavy goods. 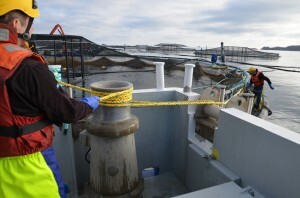 Their use has multiplied dramatically over the last few years in the aquaculture industry, as farming equipment has got bigger and heavier. Their mobility and adaption to operate at sea and the dockside make them even more versatile. Even experienced Capstan operators can find themselves in potentially dangerous situations. Serious accidents can and do occur without proper training. Training is a legal requirement. The Provision and Use of Work Equipment Regulations 1998 (PUWER) require employers to provide adequate training and to ensure that capstan and winch are operated only by employees who have received appropriate training in their safe use. If you are self-employed, the regulations still apply.